Visiting the Great Barrier Reef is on the bucket list, not only for many Australians but for plenty of tourists around the world as well. Although no visit to North Queensland would be complete without spending some time exploring this incredible marine park and natural wonder, there is so much more to see and do on land. Let’s face it, you can’t stay in the water forever (unfortunately) so why not check out some of the other popular Great Barrier Reef attractions during your stay. While swimming, snorkelling and scuba diving are all popular ways to explore the Great Barrier Reef, there’s also plenty to discover on land. So when you’re feeling a bit pruney from being in the water too long, here are some great activities and attractions to check out in the coastal towns that provide access to the reef. 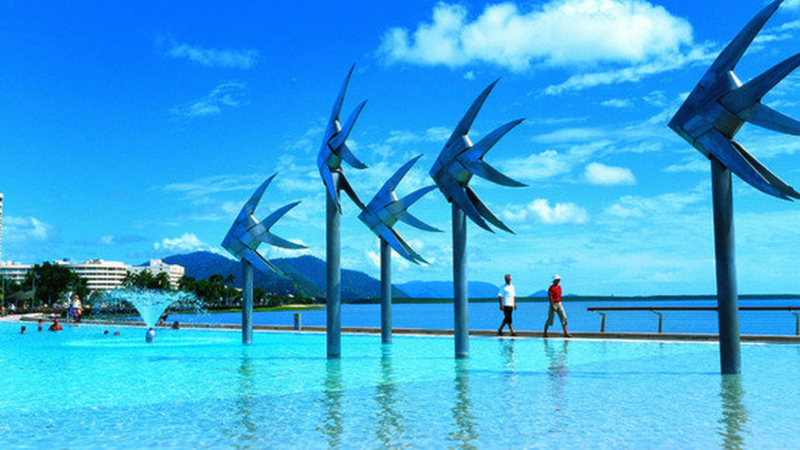 Cairns is a unique blend of bustling city and seaside charm meaning there’s always plenty to see and do. The night markets on the Esplanade are an institution in Cairns and simply can’t be missed on any trip up north. When you’re ready to step up the nightlife, head to the Reef Hotel Casino to try your luck or enjoy world-class entertainment. If you’re looking for ways to spend your day, the Flecker Botanic Gardens are lovely to explore in the sunshine and with afternoon tea on offer, you might want to linger around for fresh baked scones with lashings of jam and cream. Of course the Pier Marketplace is also a great spot to indulge in some retail therapy, visit the reef aquarium and Undersea World or just kick back with a long leisurely lunch and an ice cold drink. The Northern Beaches of Cairns are an attraction in their own right, but if you can only take so much sun and sand there are lots of other options on offer. If golfing is your thing, the world renowned championship course at Paradise Palms Golf Course has one of the most incredible clubhouses of all and is conveniently located opposite Kewarra Beach. Get up close and personal with the local wildlife at Wild World, where you can pat a wombat, cuddle a koala, feed a kangaroo and even stroke a snake if you’re game. For something a little more interesting why not visit Outback Opal Mine where you can learn how opals are uncovered and mined deep underground before being transformed into the dazzling gems that are used in jewellery. The gorgeous seaside town of Port Douglas is pretty great for doing not much at all, but when you feel like getting out and about you simply can’t miss the soft white sands and stunning photo opportunities of famous Four Mile Beach. For a different perspective, head up to Flagstaff Hill for striking views of the beach and charming little town. If you’re visiting during the sugar cane harvesting season, why not take a tour of the Mossman Sugar Mill and be intoxicated with the sweet smell that permeates the town. If you’re in town on a Sunday, head down to Anzac Park for the colourful Sunday Markets offering something for everyone. There’s no better place to watch the sun go down over Dickson’s Inlet than with a cold drink in hand at the Reef Marina.